Our Mini Kickers program is divided into 2 seasons. In the Fall, players will start with the next step in our Instructional Developmental Pathway which places four-year-old (Pre-K) players on a “Soccer Island” that resembles the shape of an actual soccer field (rectangle). Each player arrives to the greeting of a licensed Coach, and an LMVSC travel player with a “high-five” and a smile! Upon arrival, they are asked to pass or dribble the ball until the starting time. This fifty-minute session engages the players from start to finish with fun and age-appropriate activities. The players will have a ball at their feet from start to finish and while focusing on the basic technical skills of dribbling, don’t be surprised if your player comes home with a new dribbling “trick” in their bag! Towards the end of each session, the players are placed into teams and are introduced to the game of soccer where the parents are heard cheering, and the players are seen smiling as they score endless goals! In the Spring, players graduate to practicing and playing with their team. 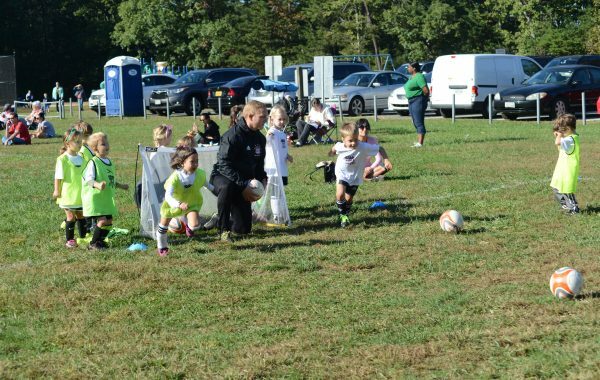 Parent volunteer coaches, with the guidance of our professional staff, start to build the foundation of the team game through fun, age appropriate activities during the week. Then on Saturdays, players get to show off what they’ve learned in games! Games are played 4 v 4 with no goalies and broken up into 4 quarters. Your child will automatically be placed into the Mini Kickers Academy program when you indicate your child’s age (4 years old) and grade (Pre-K) on their application. Please indicate any coaching requests in the “Special Request” section on the Registration form. You may also request a friend to be grouped with your child. We try to accommodate each and every request, but there are no guarantees. Two weeks prior to your first session, you will receive an e-mail indicating your practice and game schedules.